Every once in a while if you file enough chapter 7 bankruptcy cases, you are going to come across a case where there is an asset available for administration. It may be a higher than expected tax refund in which the trustee can make a claim. It may be an inheritance which was completely unexpected at the time of filing. It could be a piece of property that was either undervalued or undisclosed by the debtor. Whatever the case may be, once the trustee is aware of an asset, you have to be prepared to negotiate realistically in terms of a buyout. Most of the trustees in Illinois are decent. There are only a handful of trustees that make things difficult on the debtor without cause. If you are reasonable in your negotiations with the chapter 7 bankruptcy trustee, you stand a much greater chance of getting a settlement which is fair to your client as well as to the creditors. After all, the trustee realizes that there is an expense in administering an asset. He or she would much more likely accept a reasonable buyout rather than sell a piece of property or attempt to collect on a property that’s already been exhausted or transferred. The trustee is also acutely aware of the Illinois property exemptions which enable the debtor to retain specific property free and clear from creditors when going through a bankruptcy case. If it is a joint case, husband and wife, the property exemptions are doubled. I recently had a case where the debtor unexpectedly had a tax refund of over $11,000. The tax refund was received within two weeks of filing the case, however, at the time of the 341 meeting of creditors, the money had been mostly exhausted in home repairs. The trustee wisely saw the amount of the refund listed in the debtor’s tax return. He inquired about the refund and advised me that if we did not reach an agreement, he would be forced to object to the debtor’s discharge, obtain a judgment against the debtor and garnish her wages for the non-exempt property that was not paid over in exchange for a fresh start. Knowing the possibility of such a harsh result, I was able to convince the client to be reasonable in what she could turn over to the trustee. I also provided documentation to the trustee in the way of receipts which showed that the money was spent at home improvement stores such as Menard’s, Lowe’s, and Home Depot in an effort to repair her property. The end result is that we reached a reasonable settlement that was fair to the debtor, the trustee and ultimately the creditors. If you want to maintain credibility as a bankruptcy attorney and win the respect of clients and the trustees, then you must be reasonable when there is an asset. Don’t think for one minute that if you just avoid the trustee that the issue will go away. A smart trustee is going to chase down an asset. 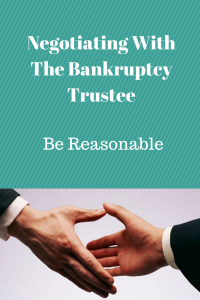 The trustee has a duty to do so under the bankruptcy code. In my 24 years of bankruptcy practice, I have had multiple asset negotiations with trustees from each county. I credit my success to the reasonableness and practicality that I bring to the table when negotiating. The trustee does not want to be taken advantage of. The trustee wants cooperation, understanding, and a fair resolution to the asset negotiation. If you go into the negotiation with those desires in mind, you are more likely than not to obtain a fair deal for your client. It would be great if we never had to worry about negotiating an asset case with the trustee. Unfortunately, that is not the reality. Assets will creep up from time to time and not all of them can be fully protected. You must prepare your clients for that possibility.